Meet Robbo-5 the robot. He's a very special robot, as he's got a maze instead of a body! He loves to play games with people and see if they can find their way through his tricky metal maze. See if you can find your way through from start to finish - Robbo-5 will be very impressed if you can do it without getting lost! if you can do it in extra quick time, he'll be even more impressed! 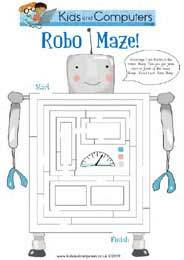 Why not Download Robbo the Robot's Amazing Maze and see if you can find your way through. This activity is aimed at 4 to 7 year olds, it's a fun way to introduce your child to the fun side of computing, as well helping to build their problem solving skills.